EFFRON: Good evening. I’m Blair Effron, and today I have the honor of welcoming to the Council Mr. Pedro Sánchez, prime minister of Spain. I’d like to also thank our CFR members for being here with us this evening and, of course, to those of you joining us remotely. Our meeting today will begin with opening comments by the prime minister, followed by a twenty-minute or so conversation with me, and then we will open it up to our members for questions. The meeting is on the record. In his short time in office, the prime minister has already established himself as the face of a new Spain. His aptly-named Agenda for Change seeks to build upon recent economic success with an enlightened and progressive approach to the most pressing issues of the day, from immigration, the environment, women’s rights, and LBTG (sic: LGBT) rights, to also reforms in justice, retirement benefits, labor, and taxation. Prime Minister Sánchez’s Spain is one defined by inclusiveness, dialogue, and connectivity, both within his own country as well as within the greater European community, an increasingly rare perspective. However, against this backdrop the prime minister also faces several challenges. He comes to office unelected, through a no-confidence vote, and his party is still a minority. Despite Spain’s 3 percent GDP growth, the prime minister must contend with stubbornly high unemployment among youths, dangerously high debt-to-GDP, a budget to be passed, and continuing unrest in Catalonia. We will discuss this and more this evening. SÁNCHEZ: Good afternoon. It is an honor to speak with you here today at the Council on Foreign Relations. Your work contributes to a better understanding of the challenges of today’s world. Last June, when the Spanish parliament entrusted me with the responsibility of leading the government of my country, I put forward an Agenda for Change with domestic goals and implications for foreign affairs too. We want to align our policies with the demands and aspirations of the Spanish modern society. Spain has gone through a particularly harsh economic crisis, as you may know, and these last years have increased inequality. And in spite of recovered economic growth, many Spaniards have been left behind. Trust in our institutions has suffered. We must restore confidence in politics so as to allow positive and effective change. We want to remain a country open to the world, engaged with it, and in favor of solidarity. We must protect what we have achieved so far and progress farther. In fact, my government is progressive, feminist, and really and clearly pro-European. Spain is a pluralist, open democracy recognized among the top democracies in the world. We enjoy significant levels of territorial self-government. We have an internationalized economy with dedicate professionals and top companies with global portfolios. Gender equality is a top priority for me. I am very proud of the leadership of women in my government. Sixty percent of my Cabinet is made up of women, including some of the most relevant departments such as economy and finance, budget, labor, justice, industry, and trade, ecologic transition, education, and defense, just to name some of them. High in my Agenda for Change is dealing with inequality in all its forms and promote equal opportunities. Social cohesion is our guiding principle. We cannot do otherwise when it comes to fighting inequality and poverty, especially children poverty, which is very high, unfortunately, in our country. In this regard, my government is fully engaged economic growth and job creation. We are designing a fair fiscal redistribution system, as well as pension reform, while being fully respectful to our European Union commitments. And concerning domestic politics, as you well know, there have been some tensions in Catalonia lately. It is certainly a challenge. We face it with a fresh, I believe, state of mind. For the first time in many years we have resumed political dialogue with the Catalan regional government, achieving some important agreements today in Spain—within, of course, the constitutional and statutory framework. We want to overcome divisions in our society and trying to find agreements in spite of our difference. As for foreign policy, I assure you that this very same guidance or guiding principles at home mainstream our action abroad. Prosperity, gender equality, justice, fair and rules-based trade, sustainable growth, fight against climate change, and security ensure beneficial for all of us. Migration, as you know for sure, is one of the hot topics in our days, especially in Europe. We had to take decisions early on—when we came into government. I recall the case of the Aquarius, which was a course of actions that showed solidarity with those in real peril for their lives. It was a matter of humanity and conscience. We are working hard to find common European answers to deal with the migration challenges. Solidarity and responsible management of migration are not incompatible, in our view. Both are necessary, and this is the approach that we have for the migration issue. But, of course, I’m open to discuss it later, in the—in the conversation. Spain is deeply committed to the European Union project. And perhaps this is very weird to say today, nowadays, for European politics, but I truly believe that more Europe is the solution to the current populist and nationalistic discourse that has thriven in some parts of Europe. In my country, and in spirt of socioeconomic pressures and the migration crisis, such xenophobic speech has hardly found any place yet. Moreover, Spain is committed to multilateralism. More than ever, we need collaborative leaderships that foster dialogue and cooperation instead of isolation and other (receipts ?) from the past. I want Spain to be up to the demands of our partners and allies, but also up to what our citizens expect us to do in Europe and globally. Taking all this into consideration, my government’s foreign policy is based on the following elements. The first one is to redouble efforts to protect our values, human rights, and security, inspired by the principles of responsibility, solidarity, and empathy. Second, reengage instead of retrench, recommitting Spain to Europe and multilateralism. Enhance collaborative leadership, as I have mentioned before. Be more active and engaged in seeking common answers to the challenges of our time, working together with partners and allies to find common ground in spite of our difference. All in all, making progress together. My government has redoubled diplomatic efforts with our partners and allies in Europe, America Latina, North Africa, and in the transatlantic relation. This goes hand in hand with being more proactive in multilateral fora to realize this agenda. We will focus on our action in the following areas. The first, we place or we will place human dignity at the very center of our policy since it is the founding value of freedom, justice, and peace. We will do this in the United Nations and other multilateral fora such as the Human Rights Council. This idea will inspire all of our public policies in Spain. Humanitarian affairs will be high in our agenda. We will continue to insist in accountability for war crimes and other human rights violations. Second, Agenda 2030 will mainstream our whole public action. In this week of the United Nations General Assembly meeting, I want to stress the importance we give—this government, this new government in Spain—to the 2030 Agenda for Sustainable Development. This is why I have appointed a commissioner on the 2030 Agenda that is linked to the presidency of the Spanish government. And while we sit here and discuss, conflicts continue to rage on in too many ways. Syria and other regional conflicts with so dire humanitarian consequences represent the collective failure of our key principles and institutions. (Ruined ?) cities and chains of refugees in danger cannot be again any new normal of international relations. This is what I believe. We will never accept the indiscriminate bombing of civilian populations, reports of torture practice, let alone the use of chemical weapons in Syria or anywhere else. As an example of our engagement, I have advocate Spain’s commitment to international missions, whether under U.N., NATO, or European Union flags are extensive. Nearly three thousand Spanish soldiers are currently deployed in missions overseas far away from our borders, from the Baltics to Iraq to Sahel, protecting common security and working for regional and global stability. The fight against terrorism, especially Daesh, is another priority for us. As you know for sure, we have suffered jihadist terrorism in Spain. We are committed to international efforts, including through our contributions to the Global Coalition Against Daesh, where Spain forces and security personnel train Iraqi soldiers on the ground together with other allies. And I’m also very conscious of hybrid threats that hostile actors use against our open democracies, especially in the age of hyper-connectivity. Our national security institutions work to tackle these threats closely with our European Union and NATO allies. And regarding the transatlantic relations, we must preserve the Euro-Atlantic space as a space for democracy, freedoms, and solidarity for our common security. This requires listening with empathy to each other’s concerns and working together when it comes to common challenges and threats. And in truth, we face plenty of threats, as you know for sure. We want to strengthen and make our transatlantic relationship more resilient in the face of the new times. Where Europeans and Americans work together, I believe the potential for joint action is immense. It cannot be matched by other powers out there. Our engagement in NATO is perfectly compatible with our efforts with other European Union members in order to develop the common security and defense policy. And a European Union that assumes a greater share of security responsibilities can only benefit our shared security and transatlantic relations altogether. EFFRON: Mr. Prime Minister, thank you very much again. Let’s start, if we could, with Europe and Spain’s role in that. I was struck during your remarks with some of the words you used: engagement being the answer to European issues, pluralism, personal freedom is important, welcoming and open immigration. These are certainly not the kind of words, the kind of language we hear coming out of Europe now. And with everybody else moving right, is there something about Spain and the mainstream population that you think is different, where you can actually maintain the current position without having to follow the rest of Europe and move more towards the right? SÁNCHEZ: Well, first of all, I do believe that for Spaniards, the idea of the European Union, it is completely identified with democracy, liberty, our freedoms, and prosperity. And this is—this explains why the—when you see the polls at the European level, you see the major population in Spain supporting and backing the idea of the European Union, even though it is true that during this last decade of economic crisis we have suffered some of the faults of the—of the failure to respond to this economic crisis by the European Union institutions. But on the bases, I would say that, for Spaniards, not only the youth, but especially the old people, the older people, they truly believe in the potentiality of the European Union. Then I would say that, of course, the populists and the anti-Europeans that are increasing their social support all around the European Union, they scream a lot, they make a lot of noise, but I don’t think that they are the majority of the population of the European Union. We are struggling with this anti-European populism movements that want to divide and to fragment the European Union, but I truly believe that the majority of the European Union and the European citizens, they really believe that the only way to resolve most of the problems that we have now on the table, you need a stronger European Union. And this is something that is—that is dividing the right-wing party in the European Union, the popular party, because you see some of its members more on the extreme right, looking to the extreme right, and others are looking to the center-left that we represent, for instance, in Spain. So we shall see what happens after the European elections, but I think that, even though we are going to suffer and perhaps they will have—I mean these anti-European movements—more presence in the European Parliament, I think that we will have a majority among at least the major countries in the European Union. EFFRON: So you think that the center-left can have a resurgence in Europe? 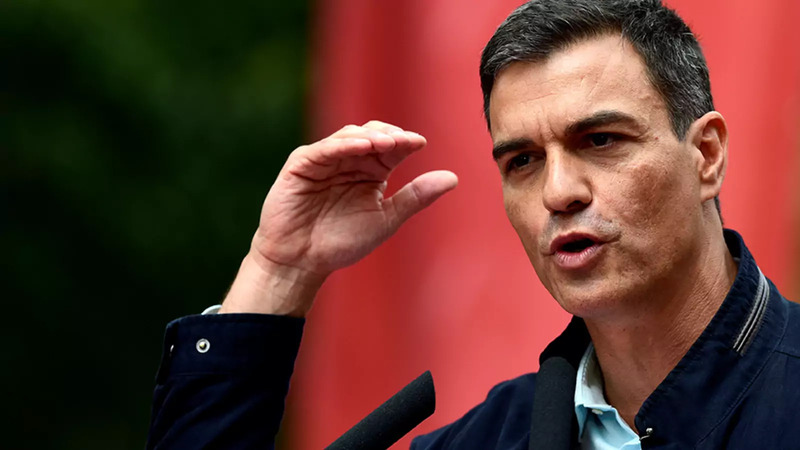 SÁNCHEZ: Well, I think that the center-left, the center, and also liberals and the center-right really trust the European Union and the European values. It is true that when you face, for instance, the migration crisis, you find some countries that are saying, well, the only way to solve the problem or the challenge of the—of the—of the migration dossier, so to say, is to close borders. But there are also other countries, not only on the center-left, but also on the center-right, that we truly believe that we have to give a humanitarian response to migration. And the migration crisis, you cannot solve it only by controlling the frontiers, which is, of course, very important. You have also to open and reinforce the dialogue and the cooperations with the countries of origin, transit, and, of course, reinforcing the policy of integration within the European Union. EFFRON: So let’s turn to, if we could, domestic Spain. You outlined an agenda for change. They’re robust goals, goals we all appreciate from equality to economic distribution, more broad-based, integration reform, tax reform, yet you are unelected and you’re in a minority party. What’s the strategy to actually get through parliament a good part of your agenda? SÁNCHEZ: Well, first of all, the motion that we won in the Spanish parliament one hundred days ago, it was something unique in the history of our—of our democracy. And it is true that, since many years, Spain really needed a change, a new impulse. And I think that we are delivering that change and this new impulse. What we suffered during these last years, especially during the latest years of the former administration, was a completely, let’s say, fight or struggle between the congress and the parliament. Why? Because while many of the laws or the parliamentary initiatives that were won by the opposition at that time in the congress suffered the veto of the former administration, so what we are now delivering is a kind of co-responsibility between the government and the parliament. So there are many, many laws and parliamentary initiatives that we are delivering because we have—we have the parliamentary majority that we witnessed in the first term of this or the latest term of the former administration. No? So, for instance, issues or policies that tackle the labor market or recuperating the principle of universality of our health system or reversing the cuts made by the former administration on public education, and so on and so forth, we find, like, a horizontal parliamentary support, not only by the center-left or the leftist political parties, but also from other political parties more linked to nationalists in the chamber, in the—in the national parliament. So I truly believe that we have a stronger government with strong parliamentary support. And I think that we have—we are delivering many important reforms in order to, let’s say, rebuild the social cohesion, which is one of our major goals during this term. EFFRON: Well, presumably, as a starting point, it’s the budget. You have a big debate going on now in your country. There’s a budget in front of parliament. You’ve said, I think, that you’d have it by December to get something passed. Do you think you will indeed get it passed? And will it look like a budget from the prior Rajoy government? And is that something that, as a center-left leader, you can sign onto? SÁNCHEZ: Well, first of all, the former administration passed the budget middle of the year. SÁNCHEZ: And we are trying to deliver the presentation and, of course, to pass the budget in the parliament on time, so to say. And, of course, it’s always complicated because you have to fix all the demands made by all the parliamentary partners that could support your proposal for the budget. But I would say that for us the red lines are very clear. The red lines is that we have to deliver and we have to fulfill our commitments with the European Union in terms of deficit, public deficit, in terms of public debt. This is clear and this is something that all the potential partners know quite well. And I really believe that they are—they assume it and they agree with it. And secondly, what we want to do is to rebuild our welfare state. For those who are not aware about the situation in Spain, if you—if you compared the figures, the aggregated figures of the European—or of our welfare state, you will find that our welfare state represents less than forty percent of our GDP, or less than thirty-eight percent of our GDP, with the average of the European Union is forty-five to forty-six percent of the GDP. So there is huge room to recover our welfare state. With this, I’m not saying that in a year, two years, or three years I want to reach that forty-six percent, but what I say is that, if we consider ourselves as a very pro-European country, it’s not only words, it’s also that we want to have a welfare state which is strong and comparable to the welfare state that the main countries have. EFFRON: Let’s turn to, if we could, another domestic issue: Catalonia. Let’s look at it from the perspective of a Catalan. They have talked about increased autonomy for forty years since you’ve established democracy. There’s still a high pitch, high fever for independence. A million Catalans marched just two weeks ago. It’s a region that’s the most economically advantaged region in the country. They will say they put ten billion euros more into the government with their taxes than come back. What’s the crisp argument to say they’re wrong beyond simply unity and nationalism being—is better? SÁNCHEZ: No, no, but you might—but what if the state of New York decided, its assembly, to not fulfill the sentence of the Supreme Court, to have a referendum of independence of the state of New York from the United States and after, the federal government is obliged to intervene because the government and the assembly breaks the U.S. Constitution, you find that the government—the governor of the—of the New York state goes to Quebec? (Laughter.) So this is more or less what happens in Spain. But the reality, when you—when you—when you listen to the independence movement, they say, well, we want self-determination. I say, well, the Catalans choose and act and decide their future in every single electoral process. I became—I became—and you—and you—and you said before—secretary-general of the Sociality Party and the leader of the opposition in the year 2014. And since then, we have had in Catalonia many, many electoral processes. And you always have the same result. It doesn’t matter if it’s in the year 2015, 2016, 2017, and I can tell you the year 2020, 2022, it doesn’t matter, you will have forty-five to forty-six percent or forty-seven percent of people that supports and backs pro-independence movements, and then you have the rest that they don’t support the independence in Catalonia. So the point is that they are a minority majority, but they don’t have the majority. SÁNCHEZ: You don’t have—so let me—let me finish the reflection. What I’m—what I’m trying to say is that you have, like, two kinds of blocs. You have the pro-independence movement and you have the, say, the constitutional bloc. No? So what is the concept that aggregate Catalans coming from the nationalist part and the non-nationalist part? In my opinion, the self-government. And this is the proposal that we are doing and we are giving to the Catalans. We are open to open a dialogue, to reinforce and strengthen the self-government in Catalonia. But, first of all, we have to rebuild loyalty among the institutions, not only vis-à-vis the Catalan government and the central government, but also with the other regional governments. And secondly, the pro-independence government must open a dialogue with the non-nationalist Catalans, which is, until now, not open. EFFRON: It sounds like you have had, just since June, a more open dialogue—well, from no dialogue to a more open dialogue, some conversation, your ministerial bodies of Catalan, you are speaking. Do you think by the time there’s a scheduled election for you in 2020, a scheduled election, that the Catalan issue will be less front-and-center, that you will have had a plan that gets enough of your populous to support, other than the vocal minority that you’ve talked about? SÁNCHEZ: Well, I said—I said in the—many times in the national parliament that the Catalan crisis is not going to be solved in two months, three months or a year or two years. Unfortunately, we’re going to be dealing with this crisis for some years. And it’s very interesting because I don’t—I don’t see that the center-right parties at the national level understood that they have to stop to use Catalonia as an issue to make opposition to the central government. And also, the pro-independence movement, they must understand that the priority not only for us, but also for them, is to rebuild coexistence within Catalans. And this is my absolute priority, to rebuild coexistence in Catalonia, within or among Catalans. And today, we reached a very important agreement. The first agreement that we reached, I won’t say us, but, I mean, the Spanish politics in these last ten years, a financial agreement, an economic agreement with the Catalan government in order to fulfill some of the financial obligations that we have with the Catalan government. So I think that we need to normalize our institutional, let’s say, relation in order to rebuild that coexistence among Catalans. EFFRON: Thank you. So I’m going to ask one more question and then we’re going to turn to our members. In your remarks, you mentioned many things that I would associate with a very secular approach to government and also, frankly, very progressive—women’s rights, LGBT rights. I know in the past you’ve talked about legalization of euthanasia. And even when you became prime minister, you had no crucifix, no Bible, yet you’re in a very Catholic country. How do you make that work? SÁNCHEZ: Well, I found out many years ago in our second republics that Spain was not a Catholic country. Questions from the audience. Introduce yourself and make the questions, if you would, brief. Q: Mark Angelson, vice chairman, Joe Biden Foundation, speaking for myself only. Mr. President, thank you for your gracious remarks. Tell us, please, about how you view these days what is going on to the east and northeast of you, particularly in Russia. SÁNCHEZ: Well, Europe has always a very strange and very complex relationship with the Russians. I think that we need to have a dialogue with the Russians, but, of course, we need to stick together in our values. And, of course, we disagree with the—with the approach of the Russians to Ukraine, the occupation of Crimea. And, of course, I really—I do believe that we have to open the dialogue with the Russians, but we need to be very, very strict in our principles and values. I would say that. In the back. No, yes, you. Thank you. Q: Gracias. Andres Correa, El Universal. I would like to know, how official is Mr. Zapatero’s—the role of Mr. Zapatero in your foreign policy, especially in terms of Venezuela and considering Mr. Trump’s speech today at the U.N. mentioning Venezuela? Gracias. SÁNCHEZ: Well, Zapatero and Felipe González are very engaged in different ways with the Venezuelan crisis. But the position of the Spanish government is made by me and my foreign affairs minister. And I had the opportunity to meet some of the presidents and prime ministers—well, presidents of many Latin American countries, not only here, but also personally in their countries, Colombia, Chile, Bolivia, and Costa Rica. And for me, there’s the first priority is the migration crisis, the refugee crisis. And I think that we have to give and deliver a regional response. I do believe that the BIRT (ph) and also United Nations must give a regional response to the refugee crisis. And Spain is ready to help, is ready to help. And we are working and we are talking with our comrades and colleagues in different countries of America Latina in order to deliver that response. I cannot say anymore on that at this stage. And the other part is, of course, the crisis internally, the internal crisis in Venezuela. And my approach to this is that the only way to solve the problem in Venezuela is to open a frank dialogue between the two parts of the conflict, the regime and the opposition. I had the opportunity to meet during these last years many of the leaders of the opposition. And I always tell them the same, this is something that you have to solve with the Maduro regime. And, of course, Spain is also ready to help and to facilitate that solution. Right in the front, yes. Q: Lucy Komisar. I’m a journalist. In Spain, as in much of particularly southern Europe, this big crisis of unemployment, especially among the youth. And I think a lot of this was exacerbated by the crash of ’08, which was created by the big financial institutions that were playing games with mortgages and derivatives and so on. Then the Americans said they were going to fix it, but, of course, it’s now pretty much unfixed because they don’t have the power. Q: So what are you and your colleagues in other European countries—is there anything you think you can do to control the international financial powers, the big banks that created the crash of ’08 and that if there’s another crash will be responsible for that one? What can you do? EFFRON: Maybe just turn it into your sense of the banking system in Europe today. Q: No, I had a question. I had a question. SÁNCHEZ: Yes. No, we really support the idea or the agreement of Meseberg made by Merkel and President Macron. Then we have a declaration of—a common declaration between the French government and Spanish government some weeks later about the engagement of our two governments in order to continue moving forward the European—the monetary and economic union. And we think that that idea—or in that idea, you know for sure that the challenge of the banking union is something that we are supporting very, very intensely as a Spanish government. And the other idea that we are working, because you spoke about the youth unemployment at the European level, is to build up, like, an unemployment fund for a potential crisis in the future. This is something that we’re working with different governments, with the German government, with the French government, and I think that we can do—we can deliver something soon. And finally, at the national level, our economic and finance ministry has built, like, a microprudential framework in order to overview all these potential risks that you mentioned in the financial sector. Q: Joe Hill, BlackRock. Encantados, Señor Presidente. I happen to have the good fortune to have lived in Spain three times and to go there about three times a year on business. I was there a year ago May when you were essentially overthrown by the leadership of your own party. And yet, from that moment, in less than thirteen months, you not only recuperate the leadership of your party, but launch the first successful no-confidence motion in the history of Spanish democracy. Can you talk about, from the personal side, what were you thinking? How did you do that? I mean, FIFA has a comeback player of the year—(laughter)—FIFA has a comeback player of the year, and if the EU had one, you’d certainly be a candidate. So can you talk a little about through that process of how you—how you accomplished that? SÁNCHEZ: Well, I think since 2014, our political system has been suffering many earthquakes, so to say. No? First of all, we had an earthquake within the progressive voters and the center-left parties. And we had this struggle between Podemos and the Socialist Party. Then we have another earthquake which was the independence movement in Catalonia and its political consequences in Catalonia and also in the Spanish political system. And then we have—and we are now having an earthquake in the right wing, let’s say, specter of our political system, no, where you are witnessing, like, a kind of struggle between the Popular Party and Ciudadanos in order to see who is—who’s going to lead the opposition to the—to the socialist government. No? So I had, like, different steps to make since I became secretary general, first time in the year 2014. I think that in the future I would write a book about my experience. (Laughter.) I would say that, you know, I suffered the same that many, many Spaniards and I believe many people do in this economic crisis: You fall down, but you get up and you continue. And this is the lessons that I can share with you, also in politics, especially when you speak. Because here in the United States, when you fall down, you know, you get up and you continue walking. In Spain, when you fall down, many people say, well, you don’t have any other opportunity. Fortunately for me, I had that opportunity. And when I read some newspapers saying that, you know, you have to—you must invoke elections because, you know, the power and the political action of the government is going to suffer and so on and so forth. You know? I say, well, who suffers really is the opposition, not the government. When you have the opportunity to transform and to do politics and to do good things for your society, things that I do believe that we are delivering on gender equality, labor market, childhood poverty—child poverty, and so on and so forth, I think that, yes, I’m going to last until 2020. EFFRON: So you heard it here, no early election. Q: Hola. Thank you so much for coming this evening. My name is Mark Vlasic from Georgetown, but I started my career at the United Nations as a war crimes prosecutor for Bosnia. Q: I saw you also spent time in Bosnia as well? Q: I think anyone who’s worked there leaves a bit of their heart in Bosnia. I’m curious to know what your takeaways from that experience, and have you applied that to your term in governance today? Gracias. SÁNCHEZ: Well, first of all, when I—when I hear some of the pro-independence movement in Catalonia saying that we—that more or less they are suffering the same case as Kosovo, I remember that I was in Bosnia while the Kosovo war happens. And, I mean, the situation, as you know for sure, is completely different. There’s no way to compare Kosovo with Catalonia. No? Second, the other day I had the opportunity to meet the prime minister of Austria who is now in charge of the EU presidency. And he is very, very open to, you know, to bring force and to intensify the enlargement towards the Western Balkans. And I always say it is very important Serbia, it is very important all the Western Balkans, but we cannot forget Bosnia, which is the center and the—and the heart of the Western Balkans. And I really, really think that the Western Balkans are, of course, Europe and I would say that I will fight for having them as soon as possible in our—in the European Union. I really believe that we have that historical debt with the Western Balkans. And I really believe that Bosnia, we cannot leave them alone because there are many, many—I was—I was some years ago in Srebrenica with former President Clinton and others. And I was very impressed by how the ethnic division has been consolidated within Bosnia. And this is the failure of the international community. And I think that what as Europeans we must do is to reinforce those ties with Bosnia and try to convince them that they have to make the reforms and deliver those reforms in order to become, as soon as possible, a member of the European Union. So I really, really—I’m really grateful about the opportunity that I had when was 28 years old to be in Bosnia to witness the consequences of the civil war, the ethnic cleanse politics, and, of course, the consequences of this nationalistic approach to politics. I won’t say that I’m grateful for that. I’m grateful for witnessing and, of course, I’m really grateful for being part of the United Nations. And there, I realize how important is multilateralism in our approach to international relations. Q: Hello. Seema Mody, global markets correspondent at CNBC. Mr. President, I’m interested on hearing your thoughts on trade, how you see the imposition of new tariffs from the Trump administration negatively impacting, potentially, your economy. And have you addressed this with President Trump during your visit to New York? SÁNCHEZ: Well, we don’t have the opportunity to meet or to exchange some thoughts or reflections with President Trump. I would—I would say that the economic theory has evolved during this last century. And it’s—I don’t think it’s a good idea to stick to pre-Ricardian approach to international trade. I think it’s always win-win when you speak about trade agreements, of course, sticking and defending the labor, environmental, and social standards. So I’m not—I disagree with the pre-Ricardian approach to international trade. EFFRON: So do you agree with the hardline stance taken last week in Salzburg on Brexit? SÁNCHEZ: I think that the Brexit is—perhaps what I’m going to say is a bit paradoxical, but I think that the Brexit is a great opportunity for the European Union. I was with Barnier some weeks ago in the—in Madrid speaking about Gibraltar, speaking about the Brexit. And I think that the Brexit could be a tool to reinforce and strengthen our union on many, many of those areas such as trade or defense policy or foreign affairs policies at the European level, and, of course, the economic and monetary union and so on and so forth. I think that, yes, it’s going to be hard, it’s going to be tough, it’s going to be difficult. But I think that there’s a window of opportunity for the European Union. And I do believe that when we speak about the relations, transatlantic relations and I—and I heard the Trump administration saying that the European Union is an enemy, I said that I completely disagree. I think that the European Union, a strong European Union, is important and very important for our allies, especially the United States. I think it’s good also for the United States and its interests on peace, security, economic prosperity to have a strong European Union. Q: Thank you, Mr. President. My name is Marco Alverà. I’m a member here and I run Snam, the gas business out of Italy. So you talked very eloquently about stronger integration on trade in Europe, on security, on finance, solidarity. We have a pipeline business in France and a business in Spain that are not interconnected, so you didn’t talk about energy. I know you were recently in Lisbon at the interconnection conference. What’s your view on energy? That seems like a low-hanging fruit to really push for the energy union in Europe. Thank you. SÁNCHEZ: I was joking the first time that I met President Macron because I told him that this issue of interconnectivity between the French and Spain and, of course, Portugal because we are—we are sharing the Iberian Peninsula. And I started to listen about it when I was a kid and he was a kid and Felipe González was president of Spain and Mitterrand was the president of the republic of France. But I do believe that Macron has the willingness to improve and to invest faster in order to interconnect our markets. And, of course, we share a common goal, which is to boost renewable energy and, of course, to commit with our climate change goal. And for that, I do believe that we need also to boost the interconnectivity between the Iberian Peninsula and the rest of the—of the European Union. I think we have time for two more questions. Can I go to the way back, if I could? EFFRON: Why don’t you—you’ll take the last two questions, both of you. Q: OK. Hi. Matt Kuta from Goldman Sachs. I previously started by career as a fighter pilot in the U.S. military and had the opportunity to serve with the Spanish in combat training. So world class, thank you, thank you for that. My question is, currently Spain is about 0.9 percent of GDP goes to defense spending. Despite a large boost, it’s still going to fall below the two percent NATO threshold. Given that twenty-three of the twenty-seven NATO countries don’t meet the two percent NATO, is that two percent obsolete, should it be removed? And if not, is there a path forward to get to the two percent? SÁNCHEZ: We had this very interesting conversation in the last NATO summit with President Trump. And, of course, I told publicly and also personally to President Trump that we understand his demands and we are willing to increase our defense or budget on defense. But also, I think that it’s important not to focus the debate on the two percent of our GDP on defense. Why? Because, for instance, we have two very important military bases in the south of Spain, and those bases, military bases, are used by the U.S. Army in order to keep the security of the United States because it is used also for the Middle East. And how much does it cost, that collaboration? So in a way, when you speak about the commitment of the Spanish government with NATO and with the U.S. security, you have to see it globally. You have to see not only how much did we invest globally on defense, but also how many military missions that we are providing for the security of the NATO members, for instance in Latvia or training in Iraq, with our Guardia Civil, the military forces of Iraq, and, of course, that we share our military bases for the security of the United States. I think that’s a fairer approach to the contribution of our country to the security of the NATO members. EFFRON: Can you identify yourself please? Q: Oh, is it working? Oh, OK. My name is Mara (sp) and I wanted to ask a question to the president. Thank you very much for the conversation. And I welcome very much that you talk about dialogue. But my question was, how can you start a dialogue with Catalonia when the elected representatives that resulted from the elections in December, they are still in prisons, they are in jail? And as a reminder, the six Catalan representatives that have chosen exile in countries like Belgium, Germany, and Switzerland, when there were cases in court, because there was a request for extradition for rebellion and sedition, they were all rejected. So how can you—I very much welcome that you talk about dialogue, but how can this dialogue start when elected members are in jail or exile? EFFRON: We’ll keep that really short. SÁNCHEZ: No, no. Listen, in our political systems, you will find not only a government that is in favor of the independence in Catalonia, but you have also political parties and parliamentary groups that defend pro-independence ideas in our national parliament. So what I’m trying to say is that the judicial consequences of political acts that were alerted by other political parties, it’s also very truth. No? It’s like, I mean, you have—you have different political leaders that didn’t or broke I would say the regional constitution in Catalonia, the constitution. They didn’t fulfill the alerts and the demands made by not only the sentence of the constitutional court and many times during last year, but also different reports made by the judicial team of the Catalan parliament during those days. So I understand that the situation is very complex, but I would like to stress and highlight that in our country we have and we follow the rule of law. And our judicial power is autonomous, independent. And I do believe that the duty of politicians, not only in Catalonia, but also in Spain is to reach a solution on the political side. And this is my willingness. And for that, I always say the same, the same idea: law and dialogue, because that law is not imposed. I would like to remember that the regional constitution in Catalonia and the Spanish constitution was backed and supported by the majority of the Catalan people. And these are the two constitutions, so to say, that the pro-independence parties broke last year. And I do believe that the reflections that the pro-independence movement are making nowadays, that they believe that they have to leave aside the unilateralism and restart and resume the dialogue with the—not only with the Spanish government, but also with the other Catalans that are not nationalists, is the only way to solve this very complex problem.